With so much excitement surrounding the legal marijuana industry, individuals across America are champing at the bit to start their career in the exploding business. While there is major appeal in finding jobs in cannabis growing, edible creation and concentrate extraction, these positions require an extensive background in the marijuana business, as well as advanced degrees and certifications. Despite this, entry level marijuana jobs do exist and can be incredibly rewarding. Before examining some popular entry level marijuana jobs, it’s important first and foremost to understand what the term “entry level” means when applied to the cannabusiness. While there are certainly jobs out there that demand few prerequisites to start work, these positions can still be difficult to acquire. Competition for any and every job involving cannabis is incredibly stiff, which gives the upper hand to applicants with more experience or knowledge. Not unlike acquiring other “entry level” jobs like bartending, serving, or being a barista, hiring managers are looking for individuals they feel will learn quickly and enhance the existing staff atmosphere. With that said, preferential treatment is sometimes given to applicants with industry experience. On the other hand, some employers want to find individuals with less experience so they can be trained under the manager’s specific protocol. Not surprisingly, marijuana customer service jobs account for the majority of entry level marijuana jobs in major cities. Especially in bustling metropolises like Portland, Seattle and Denver, cannabis dispensaries are flooded with resumes from a wide demographic of applicants. As I’ve been informed by dispensary managers, it is not uncommon for a single job posting for a budtender to receive over one hundred applications. When searching through Indeed.com for entry level marijuana jobs in Portland, Oregon, I found a job posting for a budtender/receptionist at a local cannabis dispensary. The posting had been on the site for nine days and had also already received over one hundred applications. Scrolling through to the next posting for budtending work, yet again the position had been applied to over one hundred times. This information is not meant to discourage interested applicants, rather, my aim is to provide the most accurate information for what jobs are out there and how to be informed. Budtending is a popularly pursued job by cannabis aficionados looking to capitalize on their passion for and knowledge of marijuana. Budtenders are positioned on the front-lines of legal marijuana distribution and play an irreplaceable role in the success of the marijuana industry. The main responsibility of budtender jobs is to assist medical marijuana patients and recreational marijuana customers in understanding and selecting products from the variety of options on display. Budtenders use their knowledge of strain differences, medical implications and cannabis culture to guide customers through the process of finding the right products to fit their needs. Not only do budtenders assist in product selection, they may also be responsible for weighing, selling and labeling/packaging merchandise, as well as distributing all legal literature to customers. It can be argued that budtending is not an entry level cannabis job, but it all depends on the specific dispensary that is hiring. While there are job postings for budtenders that require previous cannabis experience, there are plenty that explicitly detail the opposite. Though I suggest only applying for a budtending job if you have a legitimate interest and general knowledge of cannabis, don’t be discouraged by all budtending jobs in fear that you’re not qualified. Arguably, it is more important to have worked in customer service and cash handling than it is to be a marijuana whiz who isn’t comfortable interacting with customers. For this reason, this article has chosen to include budtending as an entry level marijuana job. When it comes to dispensary work, marijuana dispensary receptionist jobs are perhaps the most entry level marijuana job. Receptionists are the friendly faces you see upon entering many pot shops. These individuals process all necessary forms of customer identification and perform data entry related tasks in order to comply with local marijuana regulations. Receptionists are key organizers and assistants, helping dispensary managers with any tasks that require their attention on a daily basis. They must consistently perform customer service in person and over a wide range of forums such as email, social media and over the telephone. 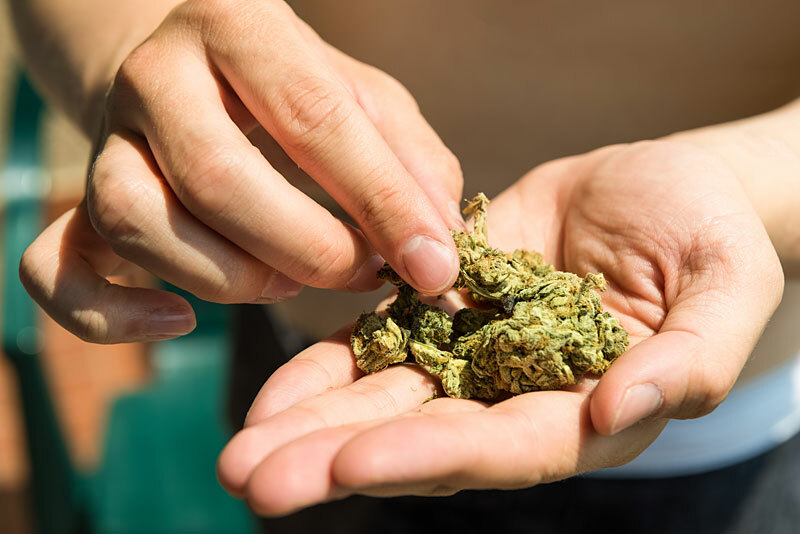 For receptionists who are delegated only to administrative and front desk related tasks, there is little hands-on interplay with cannabis products. Though it still pays to have a diverse knowledge of marijuana merchandise and legislation, it is less essential for receptionists than it is for budtenders. In many cases, receptionists work dual jobs as budtenders, or progress to budtending after gaining experience in reception. Though it may at first be discouraging not to work with marijuana products directly, this position offers a lot of room for eventual advancement. Any position in marijuana cultivation and production requires labor intensive, tedious work, but the cash payout can easily surpass that of a customer service job. Working an entry level marijuana job in this field can eventually lead to a lucrative career in growing. Historically, most workers in cannabis production were employed in the illegal marijuana industry and this is still true today from what anecdotal evidence in out there. As legal entry level marijuana jobs continue to infiltrate the industry, it remains to be seen exactly how wages will change for doing the same job as before, only this time under stringent regulation. In essence, cannabis trimming is the process of removing excess plant matter, such as fan and sugar leaves, from trichome-rich flowers on mature sativa, indica or hybrid cannabis. There are a variety of reasons for this procedure, as well as diverse trimming ideologies from numerous schools of thought. Below represent the foremost goals of trimming marijuana flower for sale. For more information, sites like Grow Weed Easy provide useful tips and tricks for trimmers. As the legal medical and recreational marijuana industry expands along with the options available for quality cannabis products, customers are looking for the best weed for the lowest price. Trimming is a major factor in producing worthwhile flower. If the flower is trimmed too loosely, the concentration of compounds like THC and CBD will be lower for their weight, proportionately. This is because surrounding plant matter contains much lower concentrations of cannabinoids than the bud. Another factor influencing cannabis trimming jobs is the appearance of the marijuana flower. Customers buy with their eyes and want to see uniform, pretty buds when perusing through jars at a dispensary. Flower that is trimmed too loosely or too tight can inhibit its ability to sell, as patients seek products that visually represent the image of what they expect their weed to look like. Again, there are different opinions about how a bud should look, however, no trimmer attempts to do a sloppy job. Two important outcomes of weed trimming are taste and harshness. Flower that is loosely trimmed contains too much plant matter and is likely going to give your lungs a workout. This is because you’re consuming a higher proportion of chlorophyll-rich, bitter sugar leaves. Harshness also takes away from the aromas contained in terpenes. Trimming is considered an entry level marijuana job, as it is a very teachable skill. Despite this, trimming can lead to advancements in marijuana cultivation, and offer a successful career in and of itself. The best, most experienced trimmers have their skill so dialed in that they are able to produce high quantities of consistently trimmed bud over a period of time. Though trimming jobs start around 12 dollars per hour, experienced trimmers can easily 20 dollars or more depending on their output. Finding an entry level marijuana job is not for the faint of heart. Odds are, you will be tasked with competing against other enthusiastic applicants. There is hope: a genuine passion to work in the marijuana industry will ultimately pay off. Especially as comprehensive legislation passes allowing for legal marijuana sales, opportunities will present themselves. This is why the best way to land a job is to stay current on cannabis legislation and history, and keep alert on job postings in your area. Untold job sectors in a variety of associated industries will be created as a result of the cannabusiness. It’s up to you to find your place in the industry!